This rigid kit building, 6m diameter, was designed to be able to be dragged by a tractor in its entirety. ﻿The development of the kit roundhouse represents the intention to create a building that can be taken apart and put back together many times over the years relatively easily, potentially in different locations. The resulting timber frame is comprised of standardised components, robust joinery, and no permanent fixings, and has a free-standing geometric rigidity. Tapered stainless steel pegs can be used instead of the usual seasoned oak pegs to fix the joints, which enables them to be beaten in and out of the joint many times. Components for timber frames are engineered, by hand and machine, from green oak round poles, to form standardised components. There are 7 different sorts of components comprising a regular roundhouse frame. With the outer bark removed and the protective paint applied to all joint surfaces, the building has a beautiful finish, worthy of a domestic environment. The normal sequence is that having received an order for a roundhouse, and resolved any design negotiations, We visit the site to complete the groundworks and establish the load-bearing pads for the building. Then the trees are felled and the frame engineered in our workshop in West Wales. Then we deliver the main frame. The assembly time of this frame is usually about 8 hrs, depending on access and the scale of the building. Then follows the roofing phase, which usually takes a few days on site. We commonly deliver finished timber frames with a watertight roof, leaving any wall construction for other parties to complete, depending on the function and style required; ranging from straw bale walls to cob, rammed earth, or timber cladding. 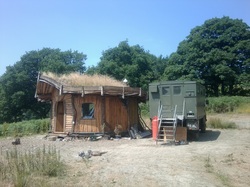 We are able to offer oak timber cladding walls for roundhouses. The reciprocal roof is a beautiful spiral of interlocking tree trunks, sat upon each other in compression, and radiating from the centre, where they are fixed into each other with long oak pegs, and create a central circular aperture of approximately a quarter to a fifth of the roof diameter. The aperture can be glazed with a toughened glass double-glazed unit, or covered with a smoke-evicting hat (a mini reciprocal roof). The roof is made watertight using an EPDM rubber membrane, guaranteed against UV damage for 50 years, and drainage of the roof is managed by means of a vertical fascia board running around the perimeter, through which water is released at engineered low points into gutters. The gutters can be fashioned from elongated rafters protruding through the fascia board that are gouged out and lined in lead or copper. The roof can be insulated on request, and is covered in turf as a standard finish.